Hi, I am interested in your 1970 Pontiac GTO (stock #1722-TPA) listed on Autotrader for $42,995. I'd like to get more information about this vehicle and confirm its availability. 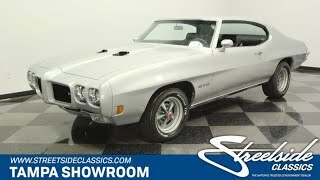 This real-deal 1970 Pontiac GTO has an upgraded V8, four-on-the-floor, an A/C interior, and a terrific respray of its factory-correct sliver paint. So yes, this muscle machine checks all the right boxes if you love to be powerful, memorable, and comfortable. Offered for only two years, code-14 Palladium Silver is a rare and distinguished treat to have on hardtop like this. Its especially true here because of the level of investment in the paint. You can tell they took care with the preparation, including removing the correct panels for spraying and returning them with a precision fit. The result is a shining package that lets the sunlight dance evenly across all the curves that arguably make this the best GTO design ever. Theres also a terrific hint of darkness with the blacked-out grille, GTO decals, and glossy black intakes on the Ram Air hood. And youll love the detail work, like the color-matched endura front end, form-fitting rear bumper, and proper Rally II wheels that all come together to give you a great period-correct legend. Inside theres an overall crisp feeling that tells you there has been a proper investment in keeping this interior looking good while remaining quite period correct. The seats shave been re-padded, the carpeting feels fresh, and the door panels are taut so this is a nice place to spend some time. Plus, you have expertly integrated upgrades like a retro-style AM/FM radio with digital tuner and cold-blowing R134a air conditioning. This keeps everyone happy while still never jeopardizing the vintage atmosphere. And of course, on a proper GTO, the best pieces are reserved just for the driver. You get the comfort of a center console and grippy three-spoke sports steering wheel. All your gauges, including the large tach are set in a nice wood-like dash panel, and the machine turned lower dash is a GTO favorite. Plus, we know your right hand wont be able to resist the Hurst shifter. Under this hood is more of this great period-correct presentation. So you have the bold Pontiac turquoise block and shining valve covers radiating from within the dark engine bay. Its properly presented, right down to the air topper with the proper surround to seal to the Ram Air hood. More than just looking great, this is Pontiacs big 455 HO cubic-inch V8. It inhales deeply from the four-barrel carburetor, and it exhales with authority out of the dual exhaust. The four-speed manual transmission is there to keep you in full control over the powerband, and in fact, control is all part of this GTOs attitude. Thats why you have power steering, front disc brakes, and sway bars front & rear. The sale comes complete with owners manual and PHS (Pontiac Historic Services) documentation. This is the great-looking and solid-driving GTO youve been waiting for, so dont let it slip away. Call today!! !